You can't champion worker rights and then treat your employees like caca. 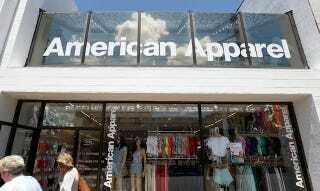 American Apparel is facing two separate complaints with the NLRB filed by employees. In the past two days, employees have filed two complaints against the company with the National Labor Relations Board. The first, from Wednesday, alleges American Apparel sent security to intimidate workers who attended a Feb. 16 off-site meeting to discuss recent cuts in hours. The second, filed today, claims that a broad media policy instituted by American Apparel's new management in January is "silencing" employees and chilling their ability to act against unsatisfactory working conditions. According to Buzzfeed, these complaints are just the latest in the company's list of problems since the firing of its founder and CEO Dov Charney last year. "The place is imploding," Keith Fink, the lawyer for American Apparel employees on both complaints, said in an interview with BuzzFeed News. Fink says he represents a number of American Apparel staff from factory workers to top brass and that the company is facing an "insurrection." Better cop all my deep V's before it's too late.